Nmt754.exe (included in nmt754.zip) is a self-extraction installation program which will extract NMT.EXE, NMP.EXE, NMT.HLP, NMT.CHM, NMT.INI, NIAPI.DLL, NISSLC.DLL, Uni_nmt.exe, NexusFTP.EXE and README.TXT, create a Program Group (Nexus Integration) and create a demo / evaluation license (expires after 30 days). Please contact Nexus Integration if you need a special test license for site evaluation. 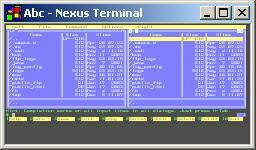 Download the latest Nexus Terminal version 7.54. Download the latest version in a zip file included a readme file. The fonts archive includes: Andale Mono, DejaVu, GulimChe, ProFont, Terminus and XTerm.